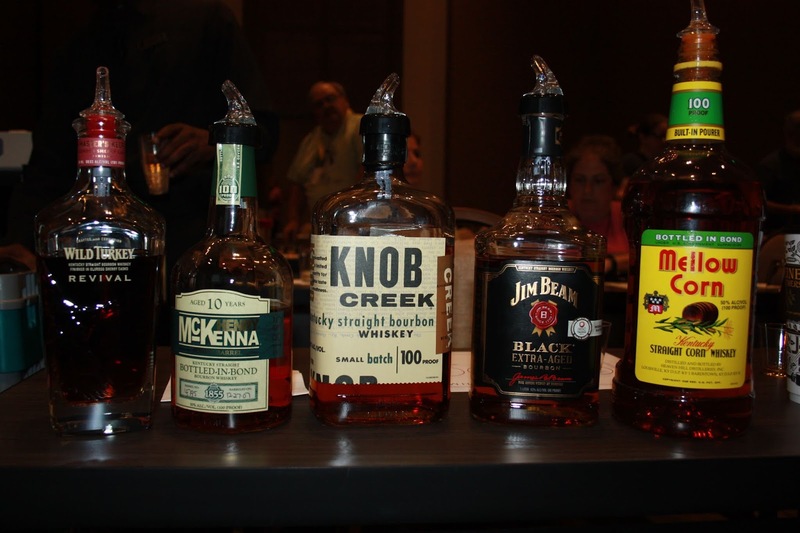 Another Kentucky Bourbon Affair—sponsored by the Kentucky Distillers’ Association—wrapped up last month in tremendous fashion and for the second year it included the “Higher Proof Expo” as the final daytime event after a full week of bourbon fantasy camp. 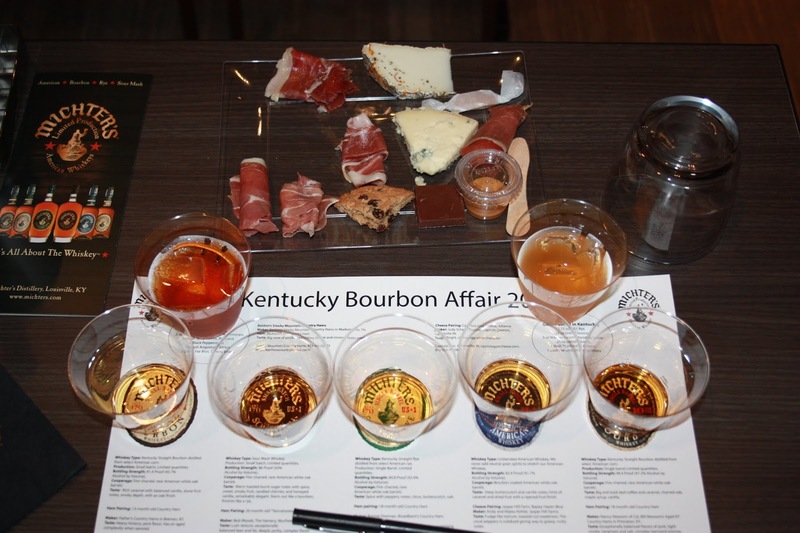 During the week the events focused on the distilleries, but the Higher Proof Expo brought the experts to us at Louisville’s newly-opened Omni Hotel for a day of bourbon-centric education and tasting. I’ve always found that the bourbon experience is influenced by my surroundings—the same bourbon can taste different (better or worse) alone by a campfire, playing poker, with a juicy steak, or at a party. Fred expanded on this phenomenon with music pairings. After an entertaining history of music and libations, we jumped right in with Fred’s playlist and whiskey samples. I was amazed at how spot-on Del McCoury’s simple pickin’ was paired with the graininess of Mellow Corn, how Andrea Bocelli brought out the complex yet approachable flavors of Henry McKenna 10-year Bottled in Bond, and how Whitesnake’s “Here I Go Again”—yes that 80’s hair band anthem—changed the experience of Knob Creek. Fred emphasized that whiskey/music pairings are inherently subjective because we all like different music, and he encouraged us to try different whiskeys with different music we like, assuring us that we would find that our preferences run deep. For my next seminar, I opted for a 180-degree turn and plunged deep into science with Dr. Pat Heist of Wilderness Trail Distillery in Danville, Kentucky. In “Using Microbiology and Biochemistry to Make the World’s Best Bourbon,” we heard about the sweet mash method used by Wilderness Trail in comparison to the much more pervasive sour mash method, and how Dr. Heist ensures consistency through science and discipline. 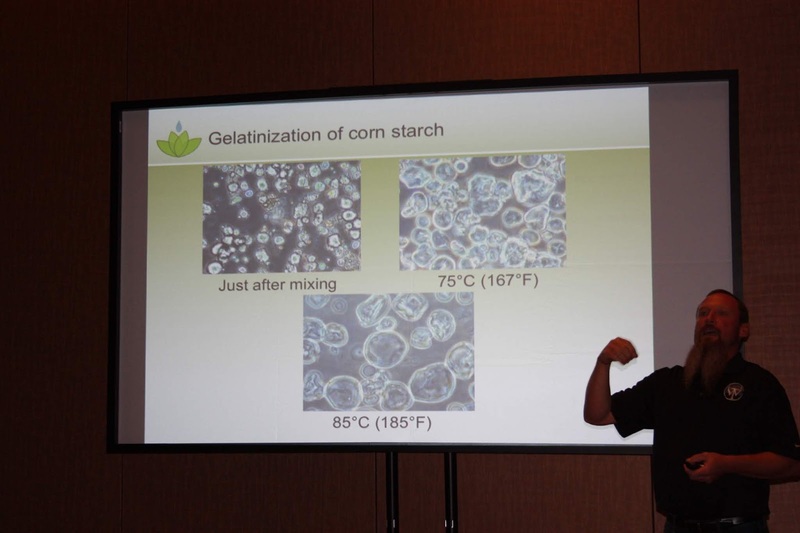 We learned about the importance of starch and moisture content in the grains, the gelatinization of corn starch at different temperatures, how yeast cell counts are monitored, and how microbial contamination is detected—and sometimes how it is used affirmatively. The amount of data collected at Wilderness Trail is mind-boggling, and I came away with a new appreciation for the science of distilling (and a new suspicion of the old-time sign at Stitzel-Weller that reads “No scientists allowed in this distillery.”). Lunch whetted my appetite for bourbon and food pairings, so I attended “Complementing, Contrasting, & Enhancing Flavor Through Whiskey & Food Pairing” presented by author Steve Coomes (a self-proclaimed “ham and spirits lover”), Kelly Ramsey of Art Eatables, and a team from Michter’s—Pam Heilmann and Andrea Wilson—who provided the bourbon. Steve curated a wide selection of country hams and cheeses, Kelly brought her chocolate and an amazing sorghum caramel, and we tasted through a variety of Michter’s whiskeys while experiencing how these rich foods changed and elevated the bourbon experience. This sort of food pairing experience is a must for any bourbon enthusiast. I rounded out my Saturday by getting down to basics with “Pot Distillation with a Thumper: Traditional Methods of Bourbon Production,” presented by Marc Dottore of Dueling Grounds Distillery in Franklin, Kentucky and Royce Neeley of the Neeley Family Distillery in Sparta, Kentucky. 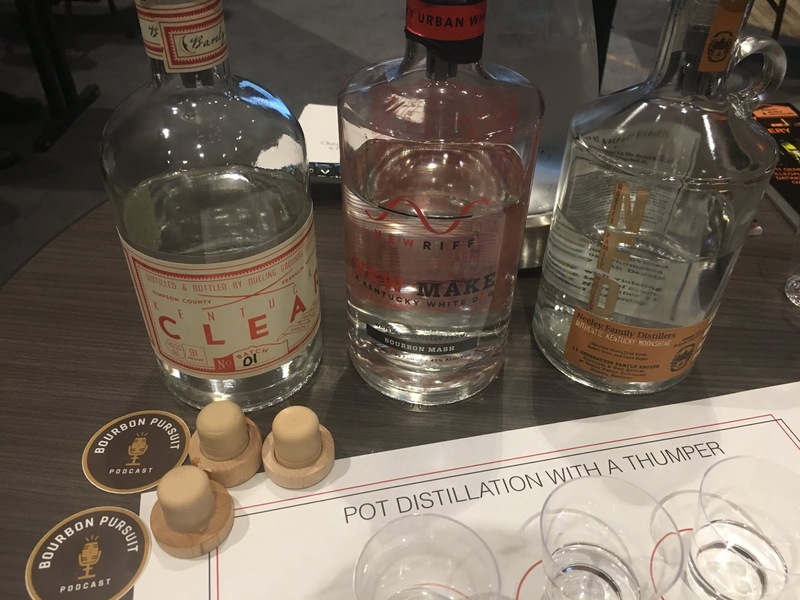 It seemed like the real challenge for these distillers is separating the heads, the hearts, and the tails—which is definitely something that needs to be done right—and it was interesting to contrast their approach with the scientific approach from earlier in the day. The history and the mechanics kept the class captivated, but when it came time to try the new make and legal “moonshine,” I was reminded yet again that my personal preference is mature whiskey. The Higher Proof Expo was a perfect opportunity for those, who like me, couldn’t make any of the distillery events during the week, but I also met friends who had been in Louisville all week and were capping off their 2018 Kentucky Bourbon Affair with a final day of in-depth bourbon experiences. With new events every year, I encourage everyone to check out the Kentucky Bourbon Affair and the Higher Proof Expo in 2019. I’ll see you there. ← Sipp’n Corn Book Review – The Bourbon Tasting Notebook (2nd Edition) by Susan Reigler and Mike Veach.